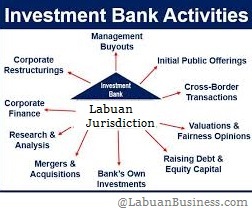 Guide to Set Up Labuan Investment Bank with license- Call us for more! Labuan Investment Banks primarily serve corporations and government bodies and high net worth individuals as part of their Wealth Management business. Labuan Investment Banks are permitted to conduct all business activities of commercial banks, except receiving individual/corporate account deposits. Labuan Islamic investment banking business, if Shariah compliant. Must maintain a physical presence in Labuan with minimum 3 staffs with annual spending of minimum RM 180,000. Permissible to establish a Marketing Office in Kuala Lumpur or Iskandar. Note: Information is correct at time of publication but may be subject to change depending on LFSA guidelines. In evaluating the best place to domicile your Investment Banking business, consider your business objectives and intended activities. Labuan may be able to help you meet your business objectives. At CP TRUST, we help clients in all their Labuan business incorporation undertakings including the application of licenses for operation. * Corporations with the necessary expertise and experience in the financial industry with at least three (3) years of good track record and regulated by an authority in their home country. 2. Key personnel may be required by the Labuan FSA to attend interviews. We provide consultation on company structure for Labuan Company set up for your Labuan Investment Banking license, documents profiling and due diligence on company incorporation, assist in providing the registered office and back-end support to ease your operations in Labuan as well as the application of marketing office/co-location office in Kuala Lumpur/Iskandar. We provide assistance from start to finish in helping you set up your Labuan investment. Consult us today! Feel free to contact us on how to best structure your banking business and license qualifications! We are here to “simplify the complexities” .